There's a hammer in most every home, but few do-it-yourselfers recognize the a tool as potentially dangerous. Follow these safety precautions in the future. There may be no tool more basic than the humble hammer. But however straightforward it may be in design and utility, there are still some important safety considerations to bear in mind when using one. Perhaps most important: Before you start swinging, take a minute to check that the handle isn’t loose or cracked. Then take another minute to put on your safety glasses. You should never strike any object without eye protection in place. Also, never use a steel claw hammer to strike hardened steel, stone, or concrete. Doing so may chip the face of the hammer and launch metal shards toward you or bystanders. If you’re working anywhere near exposed electrical wiring or other energized components, choose a hammer with an insulated handle. 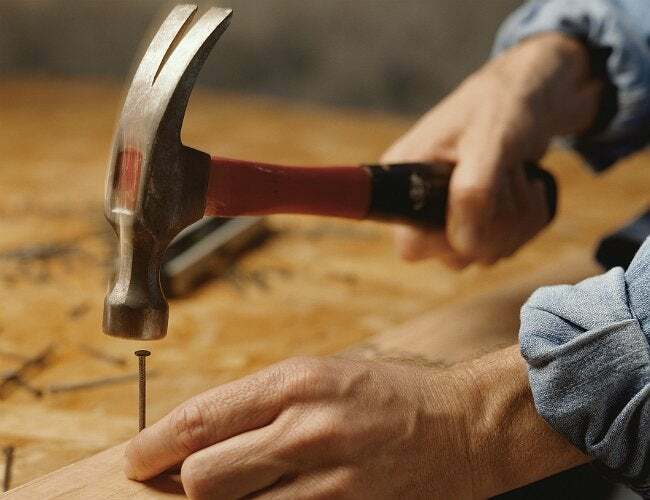 And whenever hammering a moveable object, such as a two-by-four or small sheet of plywood, first secure the material by means of a clamp or vise. Finally, before you make your first swing, make sure no one—including you—is the way of the swing path!